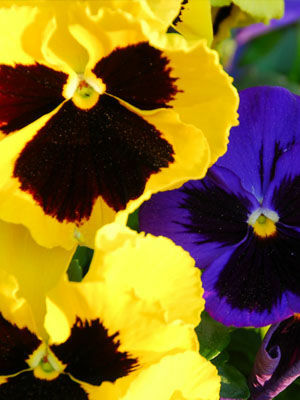 Pansies come in an endless variety of color combinations. The smaller 'johnny jump-up' types (see separate icon) have markings called "faces" and often reseed but larger paneis hardly ever do. Perennial forms, often called violas, are most at home in cool maritime climates.